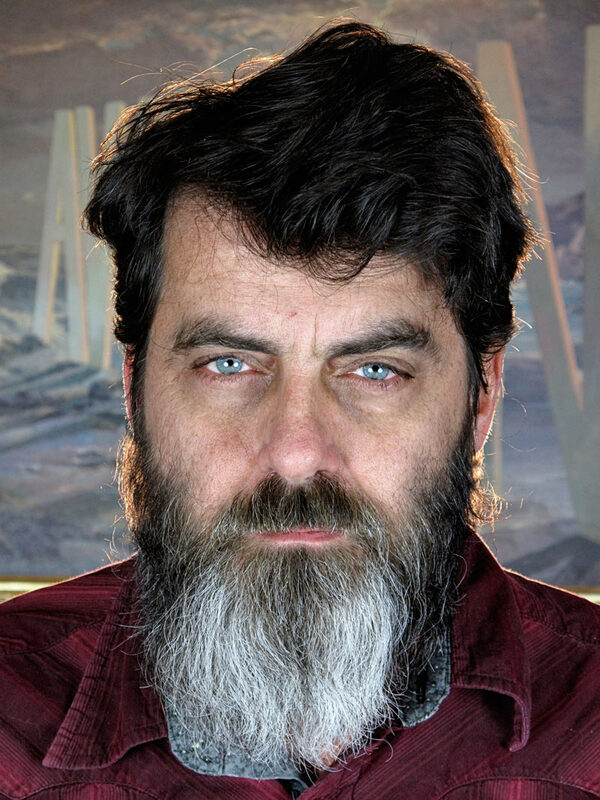 Wayne White Interview: Provocative Artist and "Pee-wee's Playhouse" Designer Sees "the F-word as Humans Barking ... It’s Inherently Comic"
Wayne White is an artist, art director, illustrator, puppeteer and much, much more. Born and raised in Chattanooga, he has used his memories of the South to create inspired works for film, television and the fine art world. After graduating from Middle Tennessee State University, White traveled to New York City where he worked as an illustrator for the East Village Eye, The New York Times, Raw Magazine and The Village Voice. White’s most successful artworks have been the word paintings featuring oversized, three-dimensional text painstakingly integrated into vintage landscape reproductions. The message of the painting is often thought provoking and almost always humorous with White pointing a finger at vanity, ego and his memories of the South. In 2009, White’s life and career were chronicled in an incredible 382-page monograph, edited by Todd Oldham, called Maybe Now I’ll Get the Respect I So Richly Deserve. Three years later, in 2012, Beauty is Embarrassing, was released. The documentary is a funny, irreverent, joyful and inspiring work that features the life and times of one of America’s most important artists. Melissa Parker (Smashing Interviews Magazine): Wayne I found the documentary, Beauty is Embarrassing, inspirational not only for artists but for anyone who wants to think outside the box. Wayne White: The film is Neil Berkeley’s creation. I didn’t want to do it at first, but he talked me into it. It was hard to get going. Nobody was interested in a movie about me. Nobody had heard about me, so he took it on his own. It was his first feature and first time he tried anything like that. He did a great job. The whole time Neil was doing it, I didn’t believe in it. I didn’t think he was going to pull it off, to tell you the truth. I guess the only motivation I had in doing it was that I just simply wanted to tell my story, so I let him tell my story. Everything else that’s happened, the inspirational message and all that were never intentional at all with me. I never set out to be an inspirational figure. I never even thought I had stuff to say. That’s all been sort of a strange surprise (laughs). Melissa Parker (Smashing Interviews Magazine): But a good surprise. Wayne White: A good one … well, it’s mixed. It is odd to suddenly be an inspirational figure. It’s odd because I’ve been alone for all these years. I’ve been working pretty much a freelancer alone in the studio for 30 years. I’ve never taught and never been in front of groups all that much, so it has definitely changed my life. And yes, it is ultimately great to be a positive force in the world. It’s very nice. The difficulty is in handling it with your ego and all that other nasty stuff. Melissa Parker (Smashing Interviews Magazine): You have to try and remain grounded. Wayne White: Yes. Absolutely. And sometimes that’s hard to do especially when you’re on the road for a whole year promoting a movie about yourself. That can get kind of strange. Melissa Parker (Smashing Interviews Magazine): Tell me about the title, Beauty is Embarrassing. Wayne White: That was originally a title of one of my paintings, one of my word paintings. I came up with that thinking about my past and thinking about the attitude toward art and aesthetics from my childhood in the South in the 60s and 70s and how it was not cool for a boy to make art. In that sense, this pursuit of so-called beauty was embarrassing for a little southern boy. Then I thought of my father who’s very withholding and embarrassed by his own emotions. Many people are sort of embarrassed by the beauty of their own emotions and truth. It kind of blossomed from there. I saw it in all kinds of different aspects. People have a hard time handling beauty in general like people that are born supermodel beautiful are embarrassing examples of humanity. They’re all kind of vapid and self entitled and corrupted by their beauty. It’s a hard thing to handle. It humbles us and embarrasses us. So there are several different meanings, but it springs from that original feeling of shame coming from the culture I’m from and pursuing such a trivial thing as pretty things (laughs). Melissa Parker (Smashing Interviews Magazine): From being a small child in the South? Wayne White: Yeah. I grew up in small town blue collar South in the 70s, so there was no sense of the artist or culture or whatnot. So yeah, it’s very much a reflection of my southern roots and the working class aesthetic or whatever. I’ve always felt that way. I hit upon it in different ways in the movie like my word painting, “Hoozy Thinky Iz?” There’s a chip on your shoulder when you leave that culture and go somewhere else. So, yeah, my southern past is deeply rooted like anyone’s past, and it’s a big theme in my work. Melissa Parker (Smashing Interviews Magazine): Growing up in the South is perhaps a blessing and a curse? Wayne White: (laughs) I think a lot of people would say that about anywhere they’re from. To be trapped in any culture can be a blessing and a curse. It’s a blessing because it’s what nurtures you. There are people who love you. It’s all that good stuff about survival and instinctual warmth and family and tribal instinct, but on the other hand, it’s dogmatic and provincial. There’s nothing wrong in staying in your culture, but you’ve got to get out and see other things. The South, in particular, especially in the 60s, was a very closed off society. Melissa Parker (Smashing Interviews Magazine): And I imagine some people might think your paintings would be more beautiful without some of the expletives, Wayne? Wayne White: You said my name perfectly … I love it. I don’t hear that much. Yes, that’s true. I’m from the Bible Belt, the Baptist Church and that whole sense of prudishness. Oh yeah. Those voices have never left my head. Ever. Melissa Parker (Smashing Interviews Magazine): And I counted many drops of the F-bomb in the documentary. Wayne White: First of all, that goes again back to the director. I don’t cuss that much. I really don’t. But Neil thought it was funny to get all those “fucks” on camera so it makes me look like I’m a real foul-mouthed guy. But I don’t really drop the F-bomb all that much in real life. But I do use it in my imagery, true. I see the F-word as humans barking (laughs). It’s a bark that humans make and in that sense, it’s inherently comic. It has the shock of surprise a little bit to it, so that’s comic. It’s from the fabric of life, you know, and I use it as any artist would use it, like a playwright or novelist would use it. It’s what people say. It’s a comic word to me. Melissa Parker (Smashing Interviews Magazine): It’s just a word? Wayne White: They’re just words, and they’re out there in the world. Like I said, I want my art to be true to what it’s like to be alive, and that’s part of it. Melissa Parker (Smashing Interviews Magazine): Are you criticized by other artists because your word paintings aren’t entirely original? Wayne White: No. I surprisingly do not get that criticism, at least from other artists. They understand the conceptual importance of using the found object, and they understand it has been done a million times by famous artists. There’s a tradition of it in making pictures, so they’re all cool with it. I do, from time to time, get people who aren’t artists say, “You cheated. You didn’t make that whole picture.” That’s come up a few times in comments I’ve read online, but I’ve never really gotten any in person. I think everybody is just fine with it because collage and found objects are an accepted part of art making. Melissa Parker (Smashing Interviews Magazine): You’ve stated that humor is an important part of your art and your life. What makes you laugh? Wayne White: Richard Pryor, dogs, certain episodes of The Andy Griffith Show with Don Knotts, George Carlin, Mark Twain, Mel Brooks. A situation that is particularly funny is people getting irritated (laughs). Irritation is hilarious if it’s done right, and the timing is funny like Oliver Hardy with his slow burn toward Stan Laurel. I love Buster Keaton, all of the films of director Preston Sturges, and I love the Cohen brothers. The list goes on and on. Melissa Parker (Smashing Interviews Magazine): Do you have any of the puppets from Pee-wee’s Playhouse? Wayne White: Those belong to Paul Reubens. They are the property of the Pee-wee organization. I have kept puppets from other shows, but I was just starting out then too. I felt like I had no right to keep them anyway. I was given a great break with that job. I never made puppets professionally hardly, and I was just happy to be there. Melissa Parker (Smashing Interviews Magazine): Pee-wee’s Playhouse was always described as a children’s show, but that was not accurate, was it? Wayne White: No. We made it for ourselves. It started as an adult stage show in Los Angeles. It never really was a kid’s show, and that was part of its charm and its power was that it was presented as one, but everybody kind of knew it wasn’t. You could see it was this crazy art project that somehow got on national TV. Of course, the power of the Pee-wee character was phenomenal. Melissa Parker (Smashing Interviews Magazine): How does your music intertwine with your art? Wayne White: I’m strictly a hobbyist. I’m not a real musician. I don’t pretend to be. I’ve been around real musicians my whole live, and I know my place. But I do enjoy playing music for myself in the studio, and I use it a lot just to think when I’m alone. I love the rhythm of a banjo. Somehow it suits my nervous system, and it’s always been a natural knee jerk thing to play by myself when I’m thinking. So it’s great for me to meditate by myself with music. I never performed in front of people. I have lately because of the movie, but it’s not something I’m super comfortable with. Music is kissing cousins to painting. Music and the visual arts are very close. All of my musician friends want to be artists and vice versa (laughs). Music enters the ear like visual arts enters the eye. They go to the same place in the brain it seems like. Melissa Parker (Smashing Interviews Magazine): You say that you’re still sorting things out from the day of that horrific automobile accident in your childhood that almost killed your mother. Wayne White: That happened in north Alabama. I’m not obsessed with it, and it doesn’t directly upset me anymore, but it’s still a very strong childhood memory, and I do think about it from time to time. Like any traumatic memory, it never goes away, so what to do with it? Well, there’s not much you can do with it. You can’t dwell on it ‘cause you just feel sorry for yourself, and that’s pointless. It was an interesting act of violence though. It was very violent, so I sort of understand posttraumatic stress disorder in a weird kind of way. I had it when I was in the third grade. Like any near death experience, it gives you an edge to peek over and think about. I can’t describe it other than that. It definitely puts life into a new kind of context. It gives you an edge not to go near. You know there is one, but so what? You can’t feel proud about it either. Everybody lives with fear. Just the pure violence of it, though, is a vivid, vivid memory. Melissa Parker (Smashing Interviews Magazine): Definitely something you will never forget. Wayne White: It has made me maybe a little more empathetic. It was very violent … very. Melissa Parker (Smashing Interviews Magazine): How’s your mom? Wayne White: She was never quite the same after that. It took her a while to recuperate and learn to walk again. But she’s fine. She’s still kicking in her late 70s. Melissa Parker (Smashing Interviews Magazine): In the film, how emotional was it for you to witness your dad crying in the audience? Wayne White: That’s happened like two or three times when he has come to hear me speak, and it happened at least a few years before we even did the movie. It really freaked me out when I first saw it just ‘cause I’m in the middle of this stage thingy, I look down, and there he is losing it. That’s a strange position to be in. He did it a couple more times, and I sort of got used to it, so by the time of the movie, I knew he was going to do it again. I wanted to protect him from the camera. That was one of the few times I felt it was a little intrusive, but I thought, “Well, go ahead.” I committed to the project, and that was a part of my life. Daddy didn’t seem to have any trouble with it when he saw it, and he’s seen the movie several times. He’ll never mention it though and just pretends it didn’t happen. Wayne White: Yes. I find it funny that this man who’s been the symbol of suppressed emotion my whole life is suddenly a symbol for emotions for people all over the world now (laughs). It’s a very funny twist of fate. It is a very emotional moment for many people. It really hits a chord with people and their parents when they see that. Melissa Parker (Smashing Interviews Magazine): What do you personally need to be inspired? Wayne White: I’m a frustrated writer, someone that’s never disciplined himself to actually write paragraphs and prose, so this is my way of writing. Like a writer, I keep a notebook. Sometimes I overhear things, most of the time it comes to me when I’m thinking, and sometimes I quote things from TV, music or movies. But it’s a writer’s process. It’s a notebook full of stuff, and it’s always long in its first version. I edit, edit and edit, pare it down and pare it down until I get it to the essence just like a writer does. The only difference is I paint them as big forms instead of writing prose then they turn into pictures of forms. I get both worlds. I can tell the story, and I can paint shapes and light. I love the narrative part, and I love the pure abstract typography part. I’ve always loved letters. When I was a kid, I used to draw pictures of letters before I could even read because I thought they looked like people and trees and stuff. It’s a great release to work on form that becomes completely abstract because it’s already talking. It’s already telling a story. You don’t have to worry about putting the narrative in there. It’s doing the talking for you so you can just relax and think of them as pure forms in space. So it’s ironic. You can tell a story at the same time working this pure abstract color, shape and form way also. Melissa Parker (Smashing Interviews Magazine): Your wife, Mimi, is also an artist and writer. What’s the secret to a happy marriage between two creative types? Wayne White: I wish I could tell you the secret. I’m still figuring it out myself. That’s a loaded question (laughs). I love having an artist as my partner, as my mate. I just instinctively need and want that. That’s what makes the work alive because we completely understand each other ‘cause art is everything to both of us. That’s who we are, so there’s a great bonding just over that. Then when your kids become artists, that’s even greater, so everybody has this bond already. It can get crazy. Artist egos can get a little touchy, but we love what we do, and we share that love, and it just seems to help out during the rough times. I’ve never known anything different. I’ve always wanted this. All the girls I knew before I was married were artists. I’ve always sought out artist communities. Not that I do a lot of hanging out with other artists, but I need to know that like minds are around me. I think that’s true of any artist. As far as our marriage goes, we work on it all the time. It’s not easy. The movie makes it sound like it’s perfect. The movie makes a lot of things sound really rosy in my life, but I’m struggling just like everybody else. I’m glad Mimi and I can be seen as people who are enjoying themselves because we are. We’re having a great time. Wayne White: Like everybody, I sort of have a love/hate thing going with Los Angeles. I’ve been here 23 years, raised my kids here and have a beautiful house I barely have to leave. My studio’s here, the garden and swimming pool are here. That’s the charm of LA. The climate and environment are charming and beautiful. The city itself is a big, mean city just like all big cities. Hollywood’s reputation is well earned. It’s not a nice business to work in, but you should know that going in. Everybody knows it’s a tough way to survive, but I’m proud I survived it and made a living. Everybody hates Los Angeles though. Everybody. It’s like wherever I go, the minute they ask you where you live, they say, “Oh man!” It’s rude because they just assume they have the right now to take a shot at LA or take on that attitude. I see their point, but it’s open season on poor old Los Angeles. Melissa Parker (Smashing Interviews Magazine): Do you visit Tennessee during the year? Wayne White: Yeah, a couple of times during the year. I love the South. I love Tennessee. It’s my favorite landscape. I don’t know if I could ever live back there again, but I’ve had a good run here in LA so far. It is what it is. I’ve always needed to live in a big city. I’ve been in the big city since 1981 because I lived in New York for 9 years before LA, so I just got addicted to it. But when it starts going bad, I fantasize about Tennessee and my friends who still live there in the country. It’s a great place to go in my mind, and I always will. © 2013 Smashing Interviews Magazine. All rights reserved. This material may not be published, broadcast, rewritten or redistributed without the express written consent of the publisher. « Deana Martin Interview: Duet with Iconic Dad, Dean Martin, an Overwhelming Experience: "It Was Way Too Emotional for Me"
Last night, I saw your Independent Lens documentary and learned of your work, etc. Perhaps not needless to say;) I’m “Following” you now. I too saw the documentary. very inspiring. wish i had had the guts to choose the different path.